If you've always wanted to take your 4WD off road and travel to some of Australia’s most beautiful places, all in the name of charity, then join Australia's biggest 4WD Adventure and you won’t go alone! What is the Variety WA 4WD Adventure? How do I get on board? We’re heading to the West Kimberley! 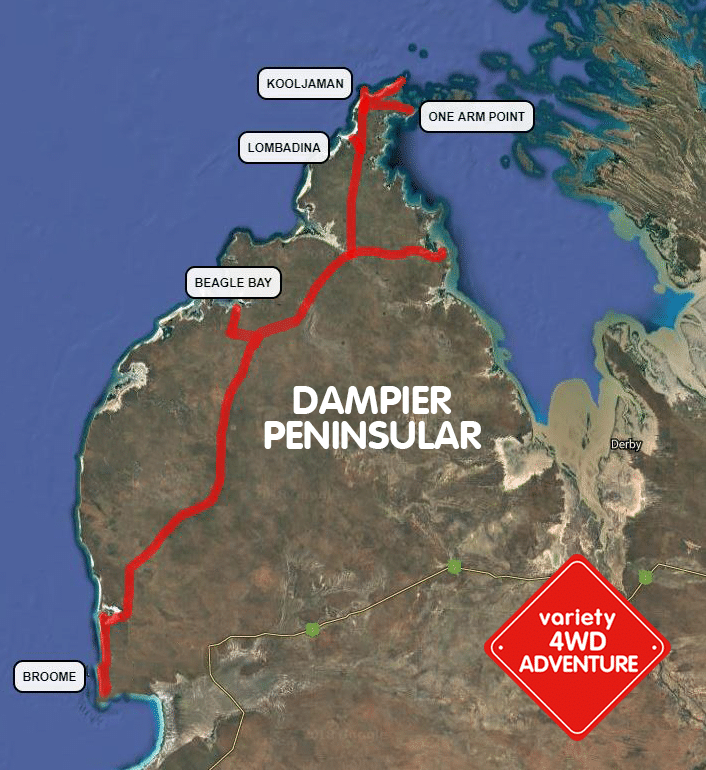 In 2019 we’re setting off from Broome and heading up the Dampier Peninsular, where a striking contrast of pindan cliffs, white sand beaches and clear turquoise waters creates the perfect backdrop to a unique cultural and coastal adventure. What better way to see one of Australia’s most spectacular regions than with great mates, entertainment, incredible food and tackling some of Australia’s best 4WD tracks – all whilst raising funds for WA kids in need. This is one not to miss! The Variety 4WD Adventure is a seven day 4WD event which travels to some of the most incredible areas in Australia, where you’ll be able to experience a great adventure and raise funds for WA kids in need. Plus you’ll be supported by experienced team of 4WDers. Radio communications, mechanical assistance and a scout to check the tracks, are all there to ensure that you are safe. But most importantly they are there to make sure you have fun! The Adventure caters for both experienced and in-experienced 4WDers alike. If you think you would enjoy 7 days of adventure, exploring Australia’s great outdoors with other like-minded people, then this is the trek for you! Another unbelievable time on the 2018 Variety 4WD Challenge. This trip had everything from the Sounds of Silence sunset dinner, to entertaining the kids at Warakurna remote community…and of course the breathtaking scenery of Uluru! A big thank you to all of our volunteers and participants for one heck of a time, and all your fundraising efforts for WA kids in need. Click here to see full recap. Opportunity to make a difference to the lives of WA kids who are sick, disadvantaged or have special needs. Please note: Fuel and vehicle expenses are not included in this cost, unless advised otherwise by the Variety WA Motoring Events team. How YOU help kids in need! There’s something that makes the Variety WA 4WD Adventure so special – by taking part you are directly changing the lives of children who are sick, disadvantaged or have special needs – and YOU get to see where your fundraising dollars go. By giving practical equipment and experiences, Variety enables children to overcome the obstacles they face, and help kids be kids. But we can’t do it without you – the funds you raise will help us help WA kids in need! HELP US GIVE A FAIR GO TO WA KIDS WHO ARE SICK, DISADVANTAGED OR HAVE SPECIAL NEEDS. Make a tax-deductible donation and be a part of something incredible. If you’ve always wanted to take your 4WD off road, travel to some of Australia’s most beautiful places, all in the name of charity, then join the Variety WA 4WD Adventure and you won’t go alone! Variety’s premier 4WD event in Australia is a seven day outback adventure taking 4WD vehicles and their owners off the bitumen and into the outback, but doing it in style. The emphasis is on good tracks, fabulous scenery, great food and wine and of course, fun and entertainment. The 4WD Adventure is Variety WA’s second highest fundraiser behind our flagship event, the Variety Bash. It is an outback adventure taking 4WD vehicles and their owners off the bitumen and into the outback, but doing it in style – fully hosted, catered, booked entertainment and a friendly bunch of people. The emphasis is on experiencing our magnificent outback environment, fabulous scenery, good tracks, great food and wine and of course, fun and entertainment. As with all Variety events, safety is a major consideration. Our experienced outback team includes a medical team, mechanics, 4WD experts and satellite phones. The Adventure caters for both the experienced and inexperienced four wheel drive enthusiasts with options to take an easier track on the more difficult terrain. Join us from May 26 – June 1 2019 as we take you on one of the best 4×4 experiences on offer and explore the West Kimberley. Rugged ranges, dramatic gorges and isolated coastlines – what better way to see one of Australia’s most spectacular regions than by 4WD, and all for a great cause. Register your interest to stay updated on all announcements. An entry fee of $330 (incl GST), payable by the entrants, is required – along with a minimum payment of $6,000 for returning 4WDs and $4,000 for new 4WD’s, that can be raised via sponsorship or fundraising.. Of course, as with all Variety events, you are encouraged to raise as much as possible over this. To ensure your vehicle meets the adventure, it will need to have 4WD with High and Low range and quality All Terrain Tyres. Most 4WD are ready to go off the showroom floor and you are also able to hire them for the event. What is NOT Tax Deductable? Sponsors and entrants should accordingly be aware that the following ARE NOT deductible as donations. These costs are met personally by the crew members. Variety is not a tax consultant and therefore assumes no liability for action taken as a result of these guidelines. In any instances where an entrant or a sponsor is uncertain of the tax implications of their involvement, they should consult their own accountant or tax adviser. Do I need 4WD Experience? The Adventure caters for both the experienced and inexperienced four-wheel drive enthusiasts. If you are looking for a seven-day outback adventure with all the excitement of 4WD driving, with a group of fun loving, like-minded people then join Variety’s 4WD Adventure. Who should be in my crew? The event caters for groups of mates or husband and wife teams. For a bit of extra fundraising cars can have 4 people in a car. As with all Variety events, safety is a major consideration. Our experienced outback team includes medical teams, mechanic and tyre experts, 4WD specialists. *All donations $2 or over are tax-deductible.